Dying Room facility to ensure if the Golf Clubs or the Walking Gear gets wet overnight in the Drying Room will have them ready to go the following morning completely dried. 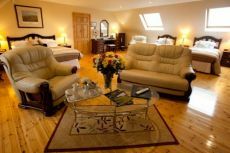 Ballybunion Guesthouse is ideally located so near to Ballybunion Golf Club and it world famous Ballybunion Old Course ranked in the top 20 of the world ranking for over 20 years. Ballybunion Town has so much to offer to see and to do. This makes the Ballybunion Guesthouse the perfect place to stay.